The problem of missing participants continues to receive a great deal of attention from plan sponsors, industry advocates, regulators and politicians. All parties are keen to address the negative outcomes that result when job-changing 401(k) participants leave behind their accounts with former employers, relocate and fail to update their address. It may surprise many to learn that there’s another problem that’s orders-of-magnitude worse, which silently devastates millions of Americans’ prospects for a timely or comfortable retirement every year. I’m referring to 401(k) cashouts, and it’s time we took serious action to address them head-on. When we consider solutions, there’s another surprise in store. The most effective solution for both problems is the same: retirement savings portability. Missing participants are a big headache for plan sponsors, as they’re simultaneously an expense, an administrative burden, a fiduciary risk and a primary driver of plan audits – right up there with delinquent contributions. Evidence of missing participants first begins to surface when plan mailings are returned undeliverable. Participants not receiving plan mailings may be unaware of key plan changes, including new investment options, fees, recordkeeper changes, company mergers or even plan terminations – events which could further de-couple them from their retirement savings. Eventually, distributable events occur for these participants, attracting unwanted scrutiny from regulators. Naturally, the DOL’s mandate is to ensure that participants receive the benefits they’ve earned, while the IRS is focused on collecting deferred taxes. That’s why uncashed distribution checks, missed required minimum distributions (RMDs) and the like can trigger plan audits, where sponsors must demonstrate the diligence they’ve applied in locating these participants, while operating in an uncomfortable environment characterized by insufficient guidance and inconsistent enforcement. From a systemic perspective, the ranks of missing participants are large and growing. A recent survey by Boston Research Technologies (BRT) on behalf of Retirement Clearinghouse found that 11.3% of terminated accounts will have a stale address. Extending the survey’s results to America’s defined contribution system suggests that there are approximately 3 million total missing participant accounts. Missing participants have preserved their retirement savings, while participants cashing out have not. This statement is intuitively obvious, but often overlooked. At a minimum, missing participants have preserved their retirement savings, instead of cashing them out. Say what you will about missing participants’ (or their plans) failing to update their addresses, but at least these folks haven’t cashed out. By contrast, participants who’ve cashed out have effectively “dropped out” of the defined contribution system, as if they’d never enrolled, never saved a dime and, to add insult to injury, may also be squandering their employers’ matching contributions. Far more cashouts occur than participants who go missing. Both outcomes begin with participants changing jobs. 6 million will eventually cash out. Incredibly, that’s 41% of the total. 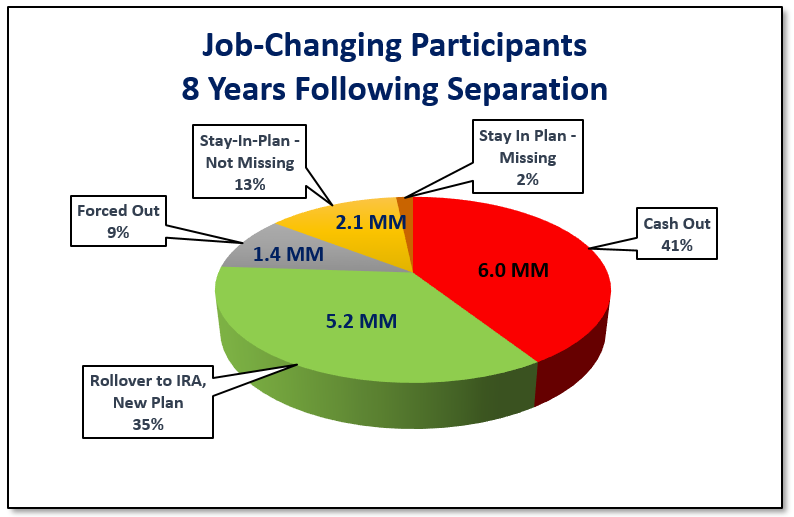 2.1 million participants, or 14.5% of job-changers, will remain in their former employer’s plan. 11.3% of these, or about 243,000, will have stale addresses and be considered missing. On an annual basis, that’s 6 million cashouts vs. 243,000 missing participants, a ratio of 25-to-1. Of the 6 million participants who’ll cash out each year, slightly more than 1/3, or 2.2 million will cash out for a true financial emergency. Tragically, that leaves 3.8 million cashouts per year that are completely unnecessary. The 3.8 million unnecessary cashouts are driven by external factors – systemic friction and a lack of participant education & assistance. 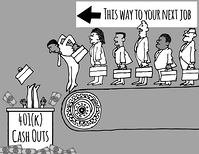 Put simply, it’s difficult to move your money forward, but very easy to cash out, despite owing taxes and penalties. The widespread introduction of retirement savings portability, via auto portability, will have a dramatic effect on reducing 401(k) cashout leakage, according to research by EBRI. When applied to participants with balances less than $5,000, EBRI’s Retirement Savings Projection Model® (RSPM) estimates that auto portability would reduce the retirement savings shortfall (RSS) by $1.5 trillion. By automatically moving retirement savings forward, auto portability would necessarily reduce the incidence of terminated participants who stay in their former employers’ plans. Reducing this population means far-fewer missing participant accounts and, by extension, fewer headaches for plan sponsors. The final “kicker” in the argument for auto portability may be its value in locating residual missing participants. Here, a core component of auto portability’s technology – the “auto locate” function – can serve double-duty -- retrieving the most-current addresses that participants provide when they enroll in new 401(k) plans. This approach is supported by the BRT missing participant study, which found that the probability of locating a missing participant with an active participant record is 67%, meaning that the auto locate function could eliminate up to two-thirds of all missing participant records. By delivering true retirement savings portability, an optimal “two-fer” solution to missing participants and 401(k) cashouts can be achieved that better meets the needs of plan sponsors, regulatory authorities and a mobile workforce. © 2018 Retirement Clearinghouse, LLC. This site is directed at, and made available to, persons in the U.S. and Puerto Rico.